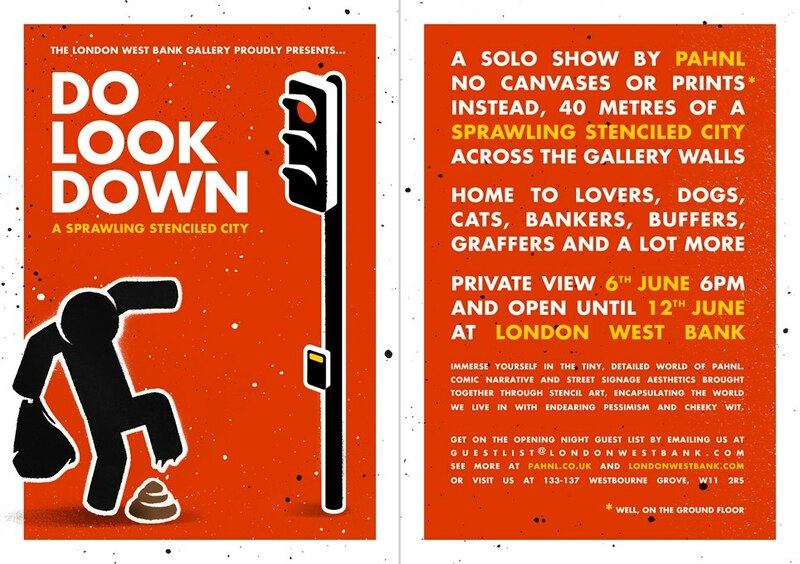 Team id-iom had a little outing to Pahnl’s solo show ‘Do look down’ at West Bank gallery last night. On arrival we were given a copy of the ‘Lowdown Times’ newspaper and a cardboard frame. All would soon become clear. The downstairs space had been transformed into ’40 metres of a sprawling stencilled city across the gallery walls’ featuring a huge selection of Pahnl’s small stylized stick men and animals up to all kinds of tricks – from bank robbers and graffiti artists to crane operators and rioters. The ‘Lowdown Times’ newspaper was a 12 page edition in the style of a local newspaper for the stencilled city. All the stories in the paper related to events on the wall and it’s written with a certain wry sense of humour. 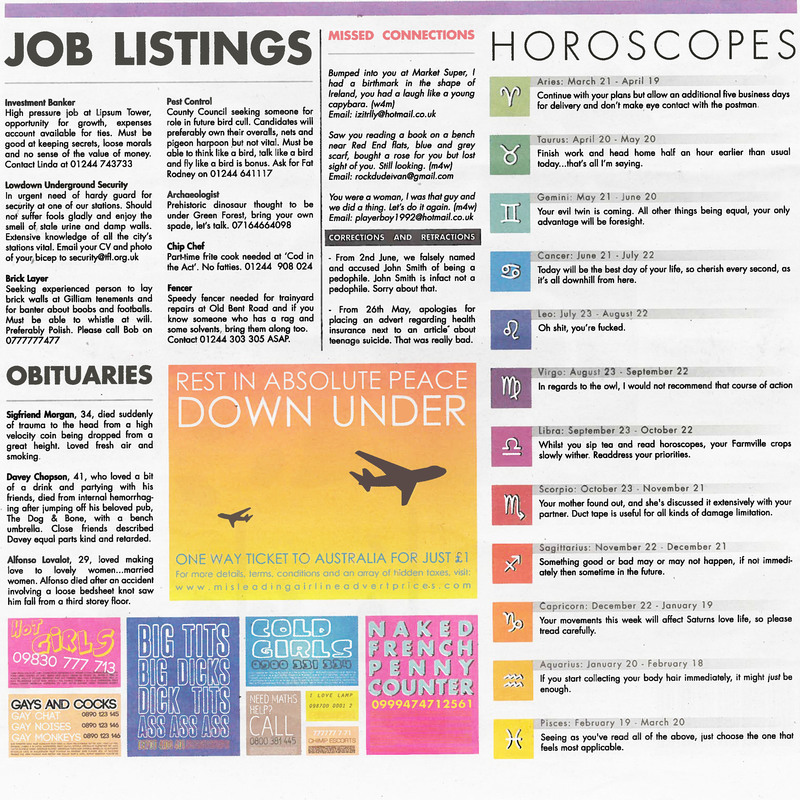 I particularly liked the horoscopes and obituary section (below). The cardboard frames we’d been given were so if there was a section of the city you liked you could frame it with the cardboard and then Pahnl would reproduce this on canvas for you (there were various sizes of frame available). It was clear a lot of thought had gone into whole thing. Upstairs there was a small selection of prints, a couple of originals on canvas and some nice repainted metal street signs. These all looked good but my favourite touch was the little comedy write ups they all had on the walls next to them. There was also a screen showing his excellent ‘Nowhere near home’ video made using light stencils. Clever work and a good night all round. It’s open until next week and I’d suggest you pay a visit.